It’s not the groundbreaking technology we were hoping to see from LG at CES — no new phones were announced, unfortunately — but the company did show off a line of smart appliances that look to be running Android. 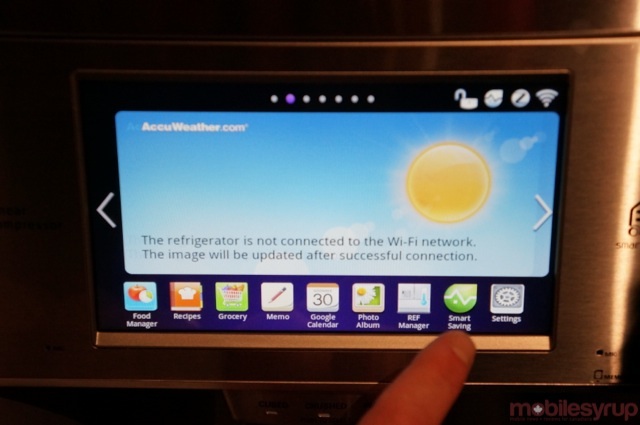 While executives would not confirm that the devices — in this case, a refrigerator — do indeed run Android, it’s clear from the dialogue boxes and app icons that it is using a slightly skinned version of Google’s OS. Along with an app called Food Manager, which monitors what’s in your fridge and how long it has been there, you can use the contents to devise recipes and share shopping lists with your smartphone using an LG-developed app. There is are Memo, Google Calendar, Photo Album, Weather apps and more, confirming that the software is powered by Android. All this to say that LG may have had a comparatively disappointing press conference for mobile fans, but anyone looking to get him- or herself a new Android-powered washing machine or stove, LG has you covered.